Power away stubborn, stuck-on food with these easy-to-use automatic dishwasher tablets. Made with plant-based & mineral ingredients, our biodegradable, phosphate-free formula effectively washes your dirty dishes, glasses and flatware without harming the planet. Now that’s what we call clean. Sodium carbonate peroxide Alkanity booster and oxidizer Mineral Peroxide is not toxic if ingested or comes into contact with skin, and it disperses safely in the environment. Disodium disilicate Builder Mineral Controls water alkalinity, provides corrosion protection. Sodium bicarbonate pH regulator and water softener Mineral This softens water by binding with calcium and magnesium molecules and allowing the active ingredients to do their job. Sodium polyaspartate Water softener and dispersant Fermented plant sugars Controls hard water effects during cleaning and helps to suspend soil. Non-toxic to skin and readily biodegrable. TAED Bleach activation Synthetic Tetraacetyl ethylene diamine, or TAED, helps our bleaching agents to be effective at lower temperatures. Sorbitol Tablet binding agent Made from plant sugars This is a sugar-derived alcohol used to bind the ingredients together in our dishwasher tablets. Sorbitan sesquicaprylate Surfactant Sorbitol & plant oils such as coconut oil Surfactants do most of the hard work to remove the dirt and grime from your clothes, dishes and surfaces. Caprylyl/capryl glucoside Surfactant Plant sugars & oils such as coconut oil Surfactants do most of the hard work to remove the dirt and grime from your clothes, dishes and surfaces. 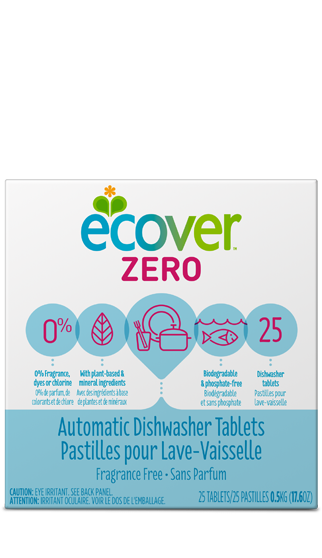 what do you think about ZERO Dishwasher Tablets 25 ct?